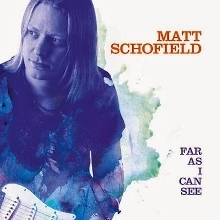 If you’ve somehow missed reading – either here on our blog or elsewhere – about the immense talents of UK guitarist and singer Matt Schofield, this week presents a terrific opportunity to catch up, with the release of Schofield’s fifth studio album Far As I Can See. Like his earlier efforts, Schofield’s Provogue Records debut finds the musician blending elements such as jazz, soul, and funk with a strong blues base, joined this time around by bassist Carl Stanbridge, Canadian drummer Jordan John, and longtime Schofield band organist Jonny Henderson. As usual, Schofield’s presentation is much more about technical style than it is flash, offering plenty of solid – but never overpowering – guitar solos, while Henderson also is afforded more of a chance to shine, not only in the way of more prominent organ parts, but also showing his hand on such related instruments as piano, wurlitzer, and clavinet. “From Far Away” kicks off the album with just the right balance of passion and punch, including some delightful grooves from Schofield, before the band slips into one of the set’s bluesiest numbers with the shuffling funk of “Clean Break”, followed soon after by the first of only two cover songs, a slowed-down, impassioned take on Albert King’s “Breaking Up Somebodies Home” that includes the first use of horns on a Schofield record as well as some soulful background vocals. The band slows things down even more on the creeping, nine-and-a-quarter-minute “The Day You Left”, then moving to the jazzy-turned-rocking instrumental “Oakville Shuffle”, a sort of modern-day “Green Onions” featuring a guest appearance from fellow UK guitarist Denny Ilett. If you’re looking for just one song that speaks to all that Schofield & co. are capable, the disc’s funky seventh track – the uptempo “Hindsight” – is most likely it, again incorporating some nice horns, while “Everything” brings things back to a simpler, though no less entertaining, level with hand claps and organ. Drummer John chips in a bit more on vocals for a breezy cover of the Neville Brothers classic “Yellow Moon”, with the swinging “Johnny B. Goode”-style “Tell Me Some Lies” and the slow grooves of the first-take, Hendrix-like “Red Dragon” helping to close out the project. For those new to Schofield, Far As I Can See is as good a place to start as any, but don’t stop there: this is the latest in a series of superb recordings from the Brit whose vision and talent have earned him a role as a major player in helping to carry the blues forward, with the band also slated for a North American tour beginning in March. If it’s a lively, refreshing batch of contemporary blues you’re seeking, you need look no further than Far As I Can See. This entry was posted in Albums and tagged Matt Schofield. Bookmark the permalink.